Natural calamities like floods and droughts are driving millions of the poorest in the country to leave their villages in search of work. As people migrate to places with employment opportunities, they leave behind the network of government support services in their villages and end up suffering worse conditions post-migration. Hallu Adivasi, a resident of Bharwa in Chhatarpur district of Madhya Pradesh, was working on the construction of a canal near his village when Down To Earth spoke to him in June. He was living near the construction site with his wife and two children. Since leaving his village, the family has not been able to get either ration from a Public Distribution System shop or care for his eight-month-old daughter from an anganwadi. “Despite working near the village, it is not easy to go there for ration after working the full day here on the site. And contractors do not let you take leave easily,” he says. He earns Rs 150 daily, an amount that is not sufficient to fulfill the nutrition needs of his family. Anganwadi workers say migration deals the hardest blow to children of migrant workers. Their health is often worse when the families return to the village. Shakuntala Yadav, an anganwadi worker of Manki village in Panna district, says, “A large number of children, mostly from tribal families, are malnourished when they return.” Yashoda, a helper at a local anganwadi in Singaro village in Chhatarpur district, says such children need to be admitted to a Nutrition Rehabilitation Centre (NRC) for treatment. But people have no option but to migrate for at least for a few months to make ends meet. 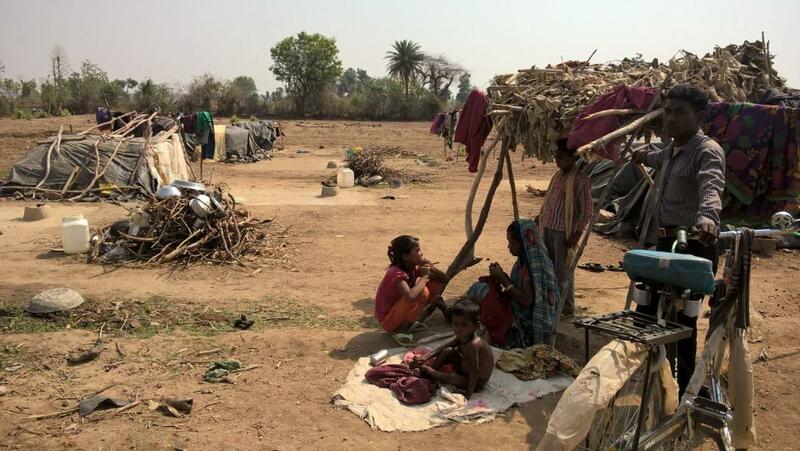 Ratan Lal, resident of Manaur village in Panna district, says that half of his village has migrated either to bigger cities like Delhi or to areas nearby for work. In Singaro village of Chhatarpur district, Ram Manohar Kaundar says that almost 80 per cent of the village has left. Not everyone is lucky to find a job though. In Manki village, Kusum Bai says that her husband Ramkumar had been sitting idle as he has no work to do. “He went to Delhi in March and retuned within a month as he failed to get any work there. I collect firewood from the forest twice a week and sell it to ensure some food for my family,” she says. Both her children are malnourished. The younger one was recently treated in an NRC. Tribal women are also migrating to cities in search of work. A 2010 study by the Planning Commission states that unemployment and poverty are the main reasons for migration.